Dominican Republic with its capital Santo Domingo is located in North America (Caribbean, eastern two-thirds of the island of Hispaniola). It covers some 48,671 square kilometers (slightly more than twice the size of New Jersey) with 10,734,200 citizens. Spanish is the language commonly spoken used by the people in Dominican Republic. Interesting info Haiti is the only bordering country. 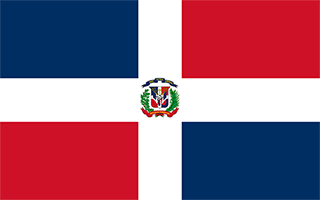 The Dominican Republic is a Caribbean country; not to be confused with the Caribbean island country of Dominica. The island lies in the middle of the hurricane belt and is subject to severe storms from June to October. Citizens of most countries can purchase a tourist card on arrival. Guaguas are the traditional means of transport in the Dominican Republic. Guaguas will be filled to the brink with people and luggage; expect to squeeze to fit more people who will be picked up en route :D. Taxi services are available but potentially dangerous when dealing with unlicensed drivers. In all cases, it's a good idea to go with a licensed driver and negotiate a price for your destination before you leave. Do not drink tap water! Locals, even in the most rural areas, will either boil their water or purchase bottled water. Eating salads or other food that may be washed in tap water is not advisable. Dominicans are kind and peaceful people and the Dominican Republic is generally a safe country. Still a third world country, poverty is still rampant so you should take common sense precautions. Attempts at speaking Spanish are a good sign of respect for the local people. The landscape is rugged highlands and mountains interspersed with fertile valleys. The average density of population is about 221 per km². The climate in Dominican Republic can be described as tropical maritimelittle seasonal temperature variation, seasonal variation in rainfall. Potential threats by nature are lies in the middle of the hurricane belt and subject to severe storms from June to October, occasional flooding and periodic droughts. To reach someone Dominican Republic dial +1-809 and +1-82 prior to a number. The local cellular networks are operated on 850 MHz, 900 MHz, 1800 MHz, 1900 MHz, 3G, 4G. Websites typically end with the top level domain ".do". If you want to bring electric appliances (e.g. battery chaarger), keep in min the local 120 V - 60 Hz (plugs: A, B, C). The sign for the locally used currency Peso is DOP. A centered white cross that extends to the edges divides the flag into four rectangles - the top ones are ultramarine blue (hoist side) and vermilion red, and the bottom ones are vermilion red (hoist side) and ultramarine blue; a small coat of arms featuring a shield supported by a laurel branch (left) and a palm branch (right) is at the center of the cross; above the shield a blue ribbon displays the motto, DIOS, PATRIA, LIBERTAD (God, Fatherland, Liberty), and below the shield, REPUBLICA DOMINICANA appears on a red ribbon; in the shield a bible is opened to a verse that reads "Y la verdad nos hara libre" (And the truth shall set you free); blue stands for liberty, white for salvation, and red for the blood of heroes.